The Cloud is the term used to describe a network of remote servers that store your files and programs, which is hosted on the internet. This means that all of the data stored on your computer is now stored on a remote server, allowing you to access it whenever there is an internet connection. What can it offer your business? You can access your documents, data and files no matter where you are. As long as there's an internet connection, you can be working - whether you're in the office or out and about. A Cloud based service is likely to be able to accommodate a lot more than your local server, and your subscription can be enlarged or reduced easily as your requirements change. It's also easier to add new users to the system. 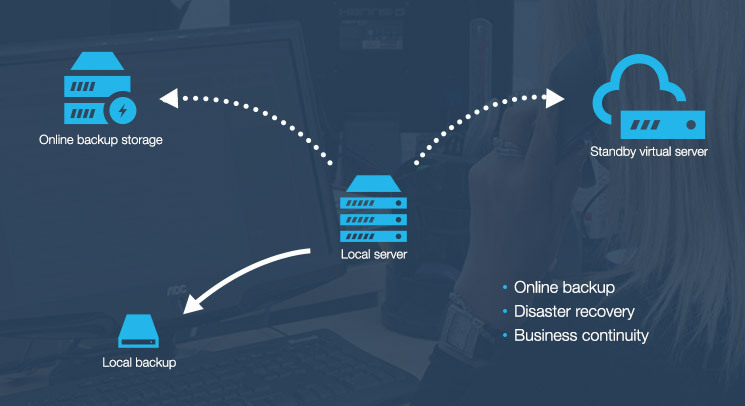 Should disaster strike at your location, all of your programs and data are safe in the Cloud. This means you can carry on working somewhere else, and you don't need to worry about rescuing your local server. Although this service is a monthly fee as opposed to a one off payment, many services are pay as you go and include automatic updates to your hardware, software and security, effectively cutting out server maintenance costs. The Cloud isn't right for every business. We can discuss the pros and cons with you, to help you decide whether to stick with a local server, consider moving to the Cloud or even to use a mix of the two. Our IT support engineers work with Cloud-based servers on a daily basis, and can talk you through our most popular platforms like Microsoft Azure and Office 365. Our team are happy to answer any questions you might have.